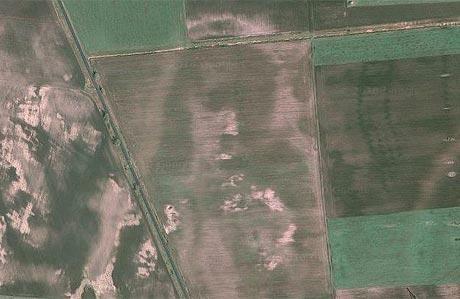 God Sighting of the Month: He’s got the whole world… on his face? Unfortunately, June was a slow month for the spirit of God in the cameo department. As we have come to notice on the Wall, at least once a month, God, Jesus or even Mary decides to show up in front of some folk in terms of cheetos, bathroom tile or a tub of pizza sauce. Why? Just because they can and it’s good for kicks on home movies. The resemblance was found by a 26-year-old man as he used the mapping website to look for holiday destinations. Zach Evans, from Southampton, spotted the outline in satellite pictures of a field on farmland near Puspokladany in Hungary. The aforementioned sightings of deity is easy to point a Pentecostal finger and crack jokes, but this? Well, let’s just say there are aliens who wish they could Da Vinci crop circles this good. Cloud shadows? Topography issues? What do you see? Whatever it is you are looking at, admit it… you’re going to check out Google Earth right after this. Perhaps these oddball sightings create a skosh of faith. Regardless, you’re still looking. idk, looks like a girl with a microphone to me. Meet me at the Cross… or maybe just an Oak Tree will do?